discontinued, as I dont have a Push 1 any more, but should be working. Note: the code also is an example of how to do parameter manipulation and patch loading/browsing from C, so may be useful for other controller development. this is a variation of the factory oneliner object which takes a fractional input. 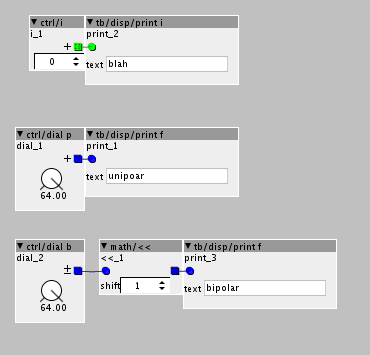 prints i - print integer (with optional text) to the console. prints f - print fractional (with optional text) to the console. print when number changes, at a max rate of once per second. 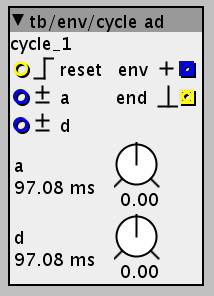 received midi from selected input and forwards it to selected output device, optionally flashing led 2 when data is sent. note: can send/receive from internal midi bus as well. record and playback k-rate signals as events... this means very long sequences can be recorded in very little memory, as it just records changes. just forgot to post it in the community library. it records 'size' events, by using a time and data table. 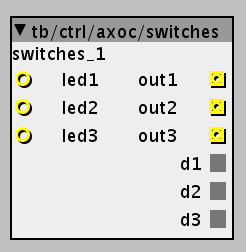 help objects for axoloti control (axoc), each object is a group of physical controls. 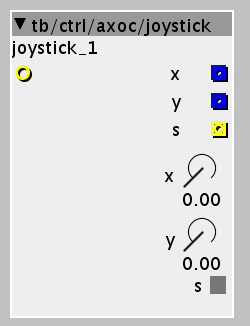 each object display the output values from the control, so the user can see the data values clearly, and the analog controls (knobs/joystick) have a light filter on them. it should be noted the switches are momentary. there are inputs for the leds, it should be noted there is no implied relationship between switches and leds, if you wish them to be connected simply connect the switch output to the led input. see help patch for example usage. if you select 1 wave, they it can act as a single wave oscillator. I'll be adding a video here, of how to create wavetables using audacity. It should be noted, there is a 'skill' in producing decent wavetables, its not all down to size , but content and also the ordering. windex selects the wave in the table, where 0..64 is proportional e.g. if the number of waves = 4, then wave 2 is selected with 32.
when combining windex and the parameter windex, the index 'bounces' off the end, it does not cycle. I found this more useful behaviour for my needs.... it also means if you set the param to 64, essentially you go backwards through the wave table. (this is not the same as playing the wave backwards!). limitation : xfade is still forward. wavetable load fn, dynamic filename variant , use trig to load , outlet indicates if load was successful or not. note: wavetable must be same number of waves, and each wave the same size, also like table/load etc, file is loaded in audio thread, so could cause audio glitches. aliasing, at high frequency its likely wavetables will alias, I may improve this overtime, or at least come up with a workflow that can help - but please note its not a simple thing to eradicate. writing this, I think it might be nice to have a reverse waves options... not really necessary, since you could always reverse table/wave cycles before loading, but might be fun, especially when using as a single wave oscillator. Anyway, could I humbly suggest to make a version of the wavetable load object with a filename input to be used with the string/index object? To make it easier to change wavetables. not something I tend to use... but sure, Ive just added it for you. there is a restriction that the number of waves and size of each wave is the same. Ahh ok. Not sure I understand it correctly; Do you mean that in a wavetable of 128 waves, each wave also has to be 128 samples long? Do you mean that in a wavetable of 128 waves, each wave also has to be 128 samples long? no... I mean if you have a wavetable consisting of 128 waves each of 2048 samples, then when you use dynamic loading, then each file you specify has to be 128 x 2048. i.e. the 'structure' of the wavetable is the same. Cool. I all ready converted a bunch to 128X2048 so that is great Look forward to try the objects out later in the afternoon. ABout the filenaming, when using the index object you have to follow certain rules. And that is fine with me and works perfectly. My WT's are called 128W001 128W002 etc. Then it is easier to switch between them with index object. Or else you have to make the patch unlive and write the new name of the new WT into the load objects and make the patch live again. That is just too complicated and destroys workflow. I was playing around a bit with the wavetable play object you made. I was just looking at the code, because I am trying to add a reset phase function. This is good for bass sounds, for example. But the code in sample rate looks alot different than from a regular phasor with reset and I didnt succed. 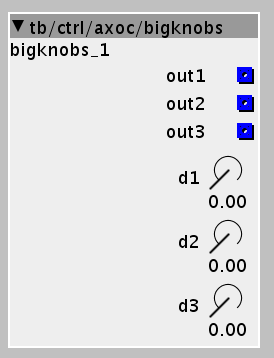 Is adding a reset inlet for the wavetable play object something you would consider implementing? Or a sync input maybe? Both can be used for resetting. Actually I think I managed to get it working on my own now I need to test it a bit further before posting it. I don't think there anything to it - just set the phase to zero. the only 'oddity' I would expect, is audio glitches if you are also modulating the table. I copied the code from a phasor with reset inlet. 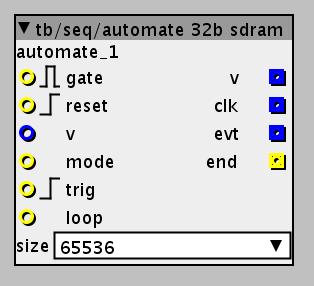 When reset inlet is triggered by the same source as the gate it is pretty much click free. Also way more consistent. And that is all I was looking for, consistency.